A gunman walked into Terminal 3 at Los Angeles International Airport Friday morning, pulled an assault rifle out of a bag and opened fire,killing a Transportation Security Administration officer at a security checkpoint and wounding two other TSA officers, authorities said. Late Friday evening, the TSA identified the slain officer as Gerardo I. Hernandez, 39, the first officer killed in the line of duty in the agency's 12-year history. TSA Administrator John Pistole said in a message to employees Friday evening that "no words can explain the horror that we experienced today." U.S. law enforcement officials confirmed to CBS News correspondent Bob Orr that the suspect has been identified as Paul Ciancia, 23, of Pennsville, N.J. Officials said he also spent some time in the Los Angeles area. A preliminary review of government terror databases and watchlists found no connections to Ciancia, and he does not have a significant police record, Orr reported. Miller also reported that Ciancia on Friday texted his parents from L.A. to New Jersey and said he was going to kill himself. They called the police. There was a response to his house. Apparently they didn't make contact with him but a roommate who didn't know where he was. Law enforcement sources told CBS News the suspect was wounded in the incident but survived and is in custody. Preliminary information indicated that the suspect may have been an off-duty TSA employee, but a federal official told CBS News the suspect was not a current or former employee of the agency. Initially, Cox said at least three other TSA officers were wounded. Their conditions were not disclosed. Later in the day, the TSA said two other officers were injured. Airport Police Chief Patrick Gannon said during the news conference that the gunman pulled an assault rifle out of a bag and began to open fire inside the terminal at 9:20 a.m.
"He proceeded up into the screening area, where TSA screeners are, and continued shooting," Gannon said. The gunman went past the checkpoint into the secured area of the airport, Gannon said. 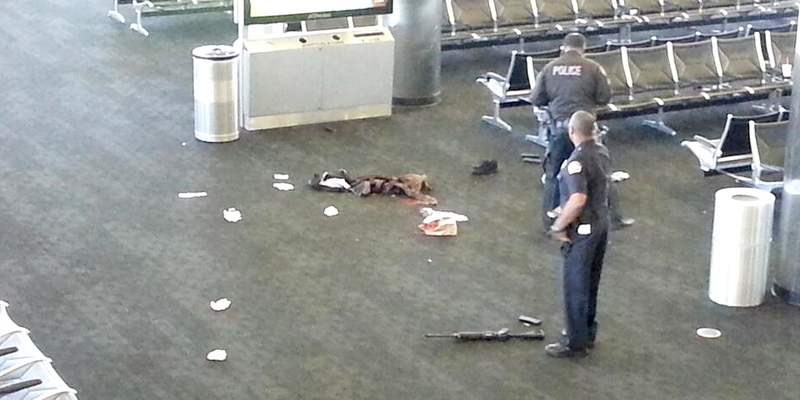 Airport Police officers tracked the gunman inside the terminal and eventually engaged with him. He was successfully taken into custody after what Gannon described as an "officer-involved shooting." "As you can imagine, a large amount of chaos took place during this entire incident," said Gannon. "We believe at this point that there was a lone shooter, that he acted, at least right now, was the only person that was armed in this incident." Gannon said police completed a security sweep of the entire airport. The suspect entered the terminal wearing military-like clothing when he opened fire, law enforcement sources told CBS News. Miller reported Friday evening that, according to multiple law enforcement sources, Ciancia had five fully loaded magazines on his person and that ammo was found in a bag nearby. A law enforcement source said "he had enough ammo to kill everyone in that terminal." Passenger Billy Bey saw the gunman. "He was walking," Bey told CBS News, as reported by correspondent Carter Evans. "I thought everything was fine and maybe this guy was just looking for his gate now. But then I noticed he had a gun at his side, a large gun. So at that point I got pretty scared." Passenger Robert Perez told CBS Los Angeles that TSA officers came through the terminal and yelled that a man had a gun. As Evans reported, photos were taken moments after police shot the gunman; one can see his rifle on the floor. A man who matches the description of the gunman was wheeled into a Los Angeles hospital. Outside Terminal 3, paramedics assisted the wounded including a TSA officer who appeared to be unconscious. Evans added that many passengers described a moment of disbelief when they first heard the shots. People locked themselves in airline offices. They scrambled for cover under airline ticket counters and one couple said they ran for an exit door onto the tarmac and hid under a plane. Terminal 3 serves such airlines as Virgin America, AirTran, Spirit Airlines, Horizon Air and JetBlue. While that terminal remained closed, much of the rest of the airport continued operating, though with some disruptions. Some LAX-bound flights that were already in the air were diverted to other airports. The ripple effect across the country delayed thousands of travelers. Hundreds of stranded passengers streamed into hotels near LAX. Meanwhile, President Obama called the head of the Transportation Security Administration to express his condolences to the families and friends of the TSA officer who was shot and killed and the two other officers who were wounded. The White House said Obama told TSA Administrator John Pistole that he is grateful for all the brave TSA personnel who protect the nation's transportation systems. Obama also spoke with Los Angeles Mayor Eric Garcetti to express his gratitude for those who responded to the shooting. The White House said Obama received briefings about the shooting throughout the day.